One evening, while sleeping peacefully in her bedroom, a noise awakens Alice. She then finds herself suddenly falling, and lands in a familiar place – Wonderland. A place that is still full of surprises! Over Wonderland glides the shadow of the Jabberwocky, a terrifying fantasy creature! Restore order... or rather disorder, back to Wonderland. Plunge back into the heart of a legendary tale in a brand new adventure starring Alice, the carefree girl with her head in the clouds! Can Alice save this crazy, madcap world from the ordered and rational reign of the Jabberwocky? 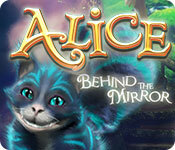 Alice: Behind the Mirror is rated 2.6 out of 5 by 58. Rated 5 out of 5 by mihbrooks from I loved it! A game that took me back to my childhood books! Rated 5 out of 5 by kateblue222 from Five stars for being different and beautiful I’m rating this game a little higher than it deserves because it is so beautiful and different. Despite the annoyances listed below, I want to go on playing because I want to know what happens. I will be waiting for a sale, though, so this review is based upon the demo period. The game is beautiful, as I said. Although the characters are not. The white rabbit looks particularly creepy. But the backgrounds, the scenery! I just want to keep gazing at this game. It's so pretty, and I love the artist's style. Such a nice change from all the dark and gloomy games. Also, it is good that the plot, though based on “Alice in Wonderland” and “Through the Looking Glass,” is different from the books. It's derived from the characters and possible situations that could happen after the books are over. Alice is called back to Wonderland to help because the Jabberwock has escaped. The HOS weren’t as annoying to me as they usually are because, though cluttered, they weren’t just “junk piles.” For example, in a shop, there were mostly things that would be in shelves in a shop. Also the mini games were fun and unique, at least as far as I got. Just so I don’t mislead anyone, here’s my list of annoyances: 1. Hints are not helpful. At one point, I thought I was going to have to quit because I was supposed to “Find the wild raspbird in the forest to free the rabbit.” The hint told me to find it over and over again. (I was more persistent in this game than I usually am when I get stuck and the hints don’t help because I thought the game was so beautiful. Usually I just quit a game that leaves me stranded.) Anyway, maybe I am just slow, but it turned out I already HAD the raspbird in inventory. I just didn’t recognize it for what it was—I thought it was some sort of a little toy on a stick or something. Also, it was unclear where the “forest” was. 2. Because the hints were so unhelpful, it would have been better if they reloaded more quickly. 3. Things operated oddly. For example, you had to already have the bread-and-butterfy net in your hand to get to where the bread-and-butterflies were. 4. Instead of sparkles, there were these big semi translucent icons cluttering up the joint. Arrows, a big eye, a magnifying glass. These icons distracted from the beautiful artwork. 5. Clicking seemed picky at times. You had to click right where something was supposed to be sometimes, but it wasn’t always clear from the graphics where the sweet spot was. 6. Click penalty—I hate these, and it was particularly annoying here where you had to click on fast moving pieces in a puzzle. I had to click over and over just to complete the puzzle. 7. The music was also annoying. I had to turn it off. 8. In order to start playing when you return to the game, you click “Play" and are returned to your profile. You then click on the profile to start. Confusing. 9. There are all these pocket watches scattered about. But they don’t DO anything when you click on them. They should be collectable. 10. Be aware--the little Cheshire cat faces that give the Lewis Carroll facts don’t come back. I am hoping that all those fun facts will be listed somewhere at the end of the game. My brain couldn’t retain them because I wasn’t in a mind set to be learning anything. After all, I was in the middle of playing a game! Yes, it is an odd game. But oddly satisfying. Try it. Rated 5 out of 5 by Tanuki_san from Pleasant diversion for an otherwise idle afternoon Not that bad a game, actually. The lack of a walkthrough should not deter the average player with at least some experience. 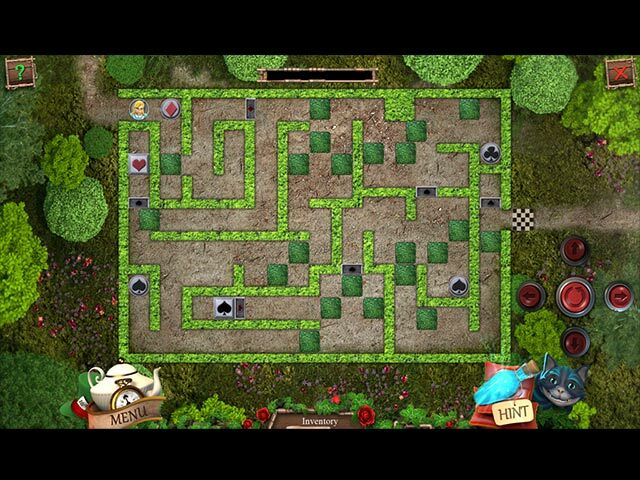 The puzzles are fairly easy save for a challenging maze. The HOPs, on the other hand, are a challenge and a half, but there seem to be no false-click penalties -- one does find everything eventually, and there's always the hint button for the impatient. One can skip a game by clicking on the timer bar once that's full. There is no choice in level of play. One game-in-game requires quick reaction time to catch the requisite number of flying critters, which can be difficult for older players such as myself. Still, it only took a little perseverance and never came close to the level of being truly annoying. Another, albeit minor, carp was the sound track. Although the music was initially quite pleasant, the lack of variation and the short loop-time eventually led me to turn it down to barely audible. All dialogue is written, so one loses nothing by doing so. The overall visual style, especially in the HOPs, is lovely, and had a different feel to it than most games of this sort here on Big Fish -- I wasn't surprised to see French names in the credits instead of the usual Russian and occasional Latvian ones. There is not the slightest attempt to evoke the original Tenniel illustrations. The plot is straightforward and serves only to push the relatively simple quest along; the story takes a back-seat to the playing of the game. There are references to incidents in the Alice books, but the story bears little relationship to the books other than using some of the characters and settings. (These are not complaints; I mention it only for the sake of Alice purists.) I award the game extra credits for the snippets of information on Lewis Carroll, the Alice books, and later adaptations thereof when one clicks on the animated Cheshire Cat faces in some scenes and the HOPs. This is what bumped my rating up to a full five stars. Rated 5 out of 5 by HawaiiGamer from Bright and Great Graphics. Love it. Instead of the popular doom and gloom, hard to see in the shadows HOG this one is bright and sunny so far. I love the cool graphics and they're pretty. I am a fair to medium HOG player not an Uber player, I always play the easiest mode and no timer, and I found this just right, there were a few items I couldn't find but they were few and the hint was refilled quickly enough. Some things I would change - give better directions to the mini puzzles. Or at least REAL directions. Not "put them in order". In order of what and how?? I could not figure out the colored ribbons on the filing cabinets, finally got that the box ribbons had to match the ribbons on the cabinet. Also you can zoom in/out with the mouse wheel, and move the scene by holding the left click. This would help since such of the objects are miniaturized and faint. No directions for this either. I also got stuck in the teapot and egg in the white rabbit's room. Otherwise this is a very enjoyable game . I can see the hate this poor game incurred, probably from uber players. If you're not one of those this should keep you happily occupied. Rated 5 out of 5 by rosieroo from My kind of game What a refreshing change , bright airy , nice characters , good story line . 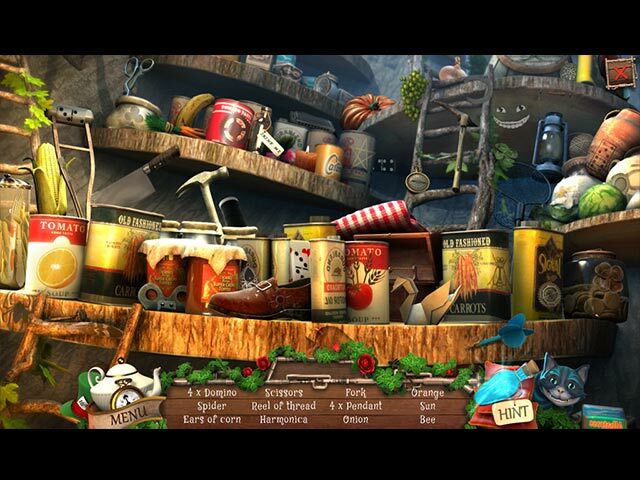 Hidden object puzzles challenging enough , puzzles good . Loved it so nice to not have eerie backgrounds , horror type stories and dark backgrounds , too many of those on the market, need more light games that are enjoyable to play like this one . A buy for me . Rated 5 out of 5 by fireball777 from Don't Believe the Bad Reviews If you are good at HOS you will love this game..The graphics and characters were charming. My seven year old twin grandsons did not appreciate the Jabberwocky. The HOS were challenging,, some items were small but not impossible to find. Simple story line and moderate puzzles. Worth the price, Everyone here loved it.. Rated 4 out of 5 by soul4ever from Clear case of HO game experience. If you like HO games that have more HO than anything else, then this game is for you! Or as Santa Claus like to say while playing this game: HO HO HO! Outside the HO scenes, you also find objects that interact with other objects, you drag a key to the door and it opens, you take paint bucket to the door it it's getting painted... Pros: Graphics are great! Colors are bright and clear. Scenario looks inviting, somewhere I would love to go for the weekend. Lots of HO scenes. I read that people are having difficulty finding them sneaky objects, well, it's Hidden, duh! Hence the Hidden objects name... If you click on the Cheshire cat smile randomly placed in the scene, it will give you interesting facts about Alice in wonderland story and the author. Hint button is helpful and fast to load. Music is cheerful and cute. Story is OK, although for me it did not matter all that much for I love this game because its abundance of HO scenes. Cons: Hint button is to bright and flashing, it's annoying. So far, no achievements whatsoever. Puzzles are way to easy. It is mostly HO game so if you're into this, go for it! I did, and I enjoy playing this game. Rated 4 out of 5 by pennmom36 from I Can Honestly Say This Game Is Educational :) This game is actually similar to Les Miserables mostly because of the "Interesting Facts" that are given in abundance throughout the game. Anytime you click on the smiling Cheshire Cat faces that are located just about everywhere, even in the Hidden Object Scenes, a pop up window appears enlightening you with a fun fact about Lewis Carroll the author of the famous novel and his inspirations about Alice In Wonderland, as well as other insights about this famous character (Alice is a real person BTW) You aren't going to be sitting on the edge of your computer chair playing for hours just to find out what happens next and the graphics won't blow your socks off either, but there are plenty of bright colors and cute animals to keep you fairly interested in the game. 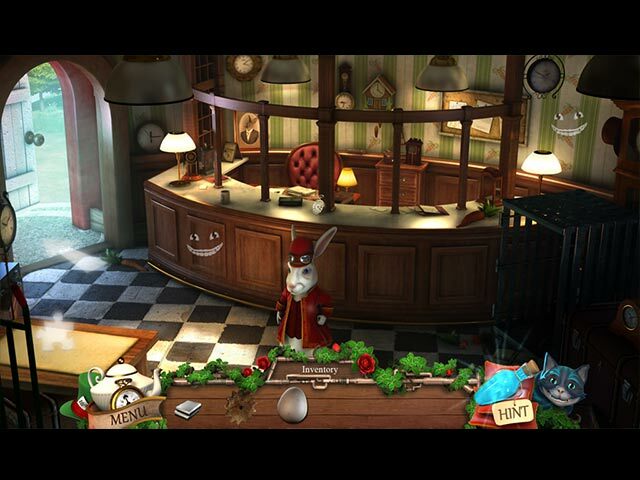 You are either going to love the challenge of the Hidden Object Scenes, or hate the frustration it causes, either way I have to admit the devs did a fantastic job blending items into the scenery so that it looks natural. Some items are partially hidden, other items are just so well blended that even I had trouble finding items and will admit I used the hint button on a few items. This game has a feature that hasn't been done in a while that will actually help you find hidden objects, you can click and zoom into the scene easily with your mouse. Personally I hated the repetitive soundtrack during the HOS, always the same track which seemed to get way too loud and just got annoying. The mini games were actually fun, and not too difficult such as clicking on paint cans two at a time to try to remember where the matching color is. This game had many features that I enjoyed, but many that I just didn't like such as having to click and drag the inventory items to the correct location rather than clicking once to pick up and a second time to place the item. I didn't feel that there was enough areas of interest in each scene, and it seemed as though the game was unorganized with a hodgepodge mixture of tasks, but on the other hand isn't that what Alice In Wonderland is all about? Rated 4 out of 5 by stormtruper from Relaxing peaceful Game that I always wanted !! I like HO game, but not too crazy about horror. This is also very beautiful picture. And I like it. Thank you for making it for relaxing game lover!!! The shadow of the Jabberwocky, a terrifying fantasy creature glides above Wonderland! Help Alice restore peace and harmony back to the land!